In case y'all missed the announcement, we're doing a "lightning" Kickstarter for another run of Munchkin Special Delivery. This campaign began yesterday and will end on Monday at noon, Austin time. Some people told us they were disappointed that they missed out on the general release on Monday; we figured this would be a way for folks who want one to order a box. And order you did - the project funded in about 15 minutes! We are not funding a general printing of Special Delivery boxes; we're printing as many boxes as we need to fulfill the pledges. If you want one, you need to back the Kickstarter, no later than noon Monday. 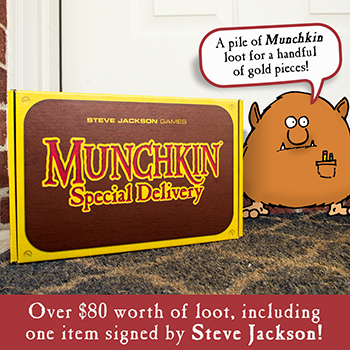 Thanks to everyone for their interest in Munchkin Special Delivery . . . this wouldn't be happening without your support! Make sure to use the #MunchkinBox hashtag and post pictures of your box on social media when you get it, so everyone can see what loot you got!